Our portable bouncer can be moved to different locations, so you can keep baby within reach at all times. 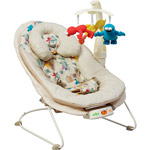 It features a 3 point harness for safety, calming vibrations and various soothing melodies. For babies up to 25lbs. Colors and styles may vary.